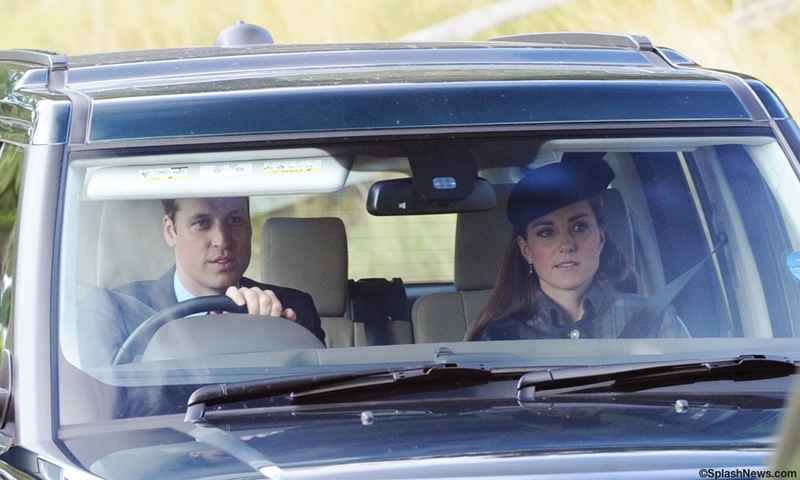 Kate and William continue their stay at Balmoral, joining other royals at church this morning. 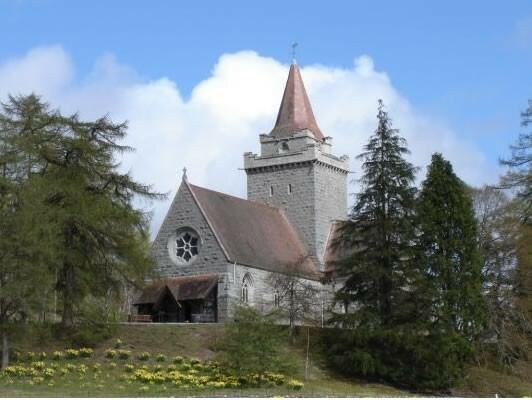 The service was at Crathie Kirk, perhaps best known as the Royal Family’s place of worship when at Balmoral. More from the Parish website. Balmoral is the Scottish home to the Royal Family, it is where the Queen has her annual holiday. It is the most private and personal of the Queen’s homes. Most senior royals are invited to spend time there with Her Majesty and the Duke of Edinburgh during the Queen’s 2-month stay at the Estate. 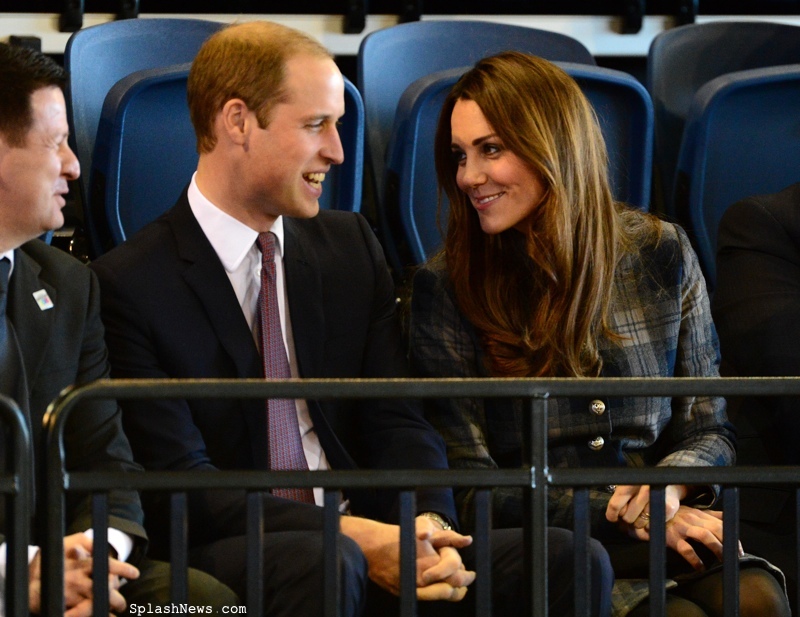 Kate, William and George flew up last week. 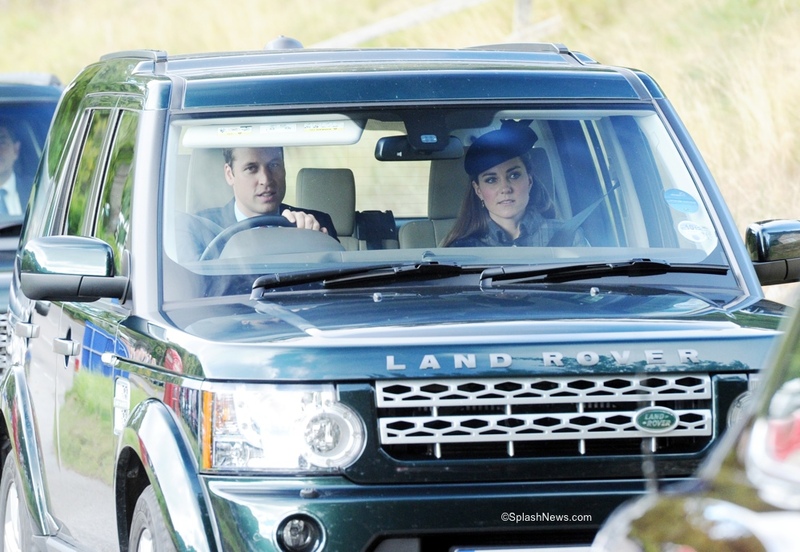 Sunday services are a tradition for the Royals. The Queen, Prince Philip, Prince Charles and Camilla also were at Crathie Kirk. Kate was in her Workers Coat by Moloh, the ‘Fairy Tale’ hat by Lock and Company, and her oft-worn Kiki McDonough Citrine Drop earrings. Below we see Kate in the hat today and on the far right, back in March of 2012 when visiting Leicester with Her Majesty & Prince Philip. It is the company’s Fairy Tale style, no longer available for purchase. Many will recall the first time we saw Kate in this coat, during the couple’s trip to Scotland in April of this year, seen below. 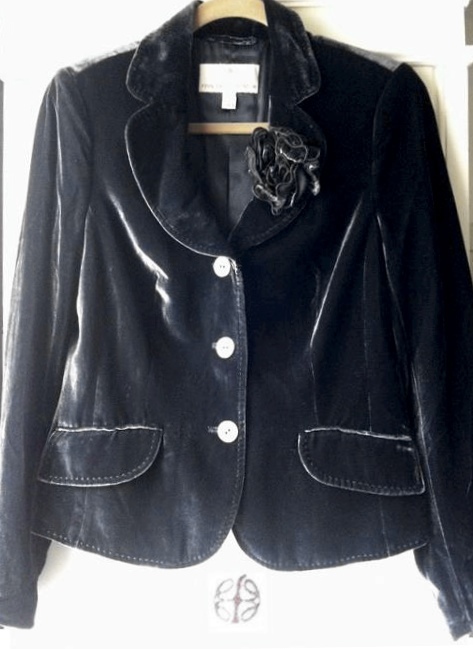 The coat remains available at Moloh’s website, but only in a size 6. 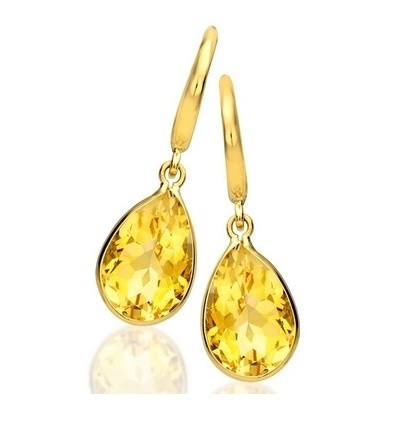 Kate’s Citrine Drop earrings by Kiki McDonough remain available online, retailing for £495, about $800 at today’s exchange rates. Also visiting at Balmoral this weekend, New Zealand’s Prime Minister John Key, his wife Bronagh, their daughter Stephanie and son Max. 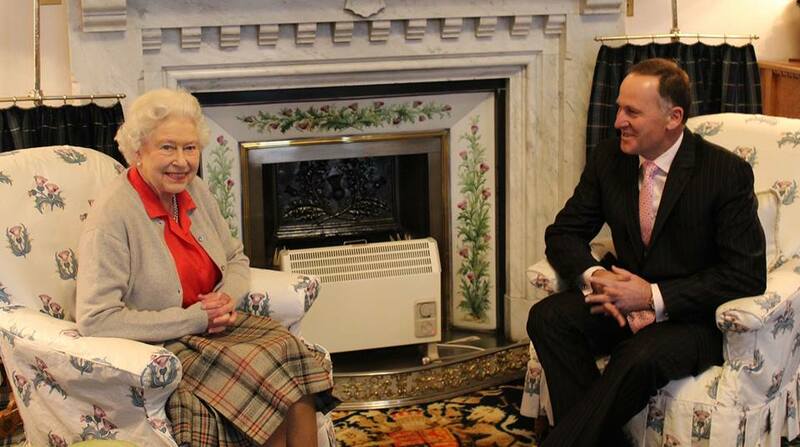 Below, the prime Minister meeting with the Queen. Mr Key said the family had asked for as much information as possible on Balmoral etiquette to avoid faux pas. Bronagh Key and daughter Stephanie had invested in floor-length frocks for the formal dinner, Mr Key and son Max had bought the required formal suits. “Tea is at 5 o’clock, you have to attend, don’t be late. The first dinner is a black-tie dinner so a long frock for Bronagh and Steffi. The next night will almost certainly be a barbecue and apparently they’re quite casual. Mr. Key said they brought some “really top” wines from New Zealand to enjoy at this weekend’s barbecue. Mr Key says he discussed the possibility of a visit to New Zealand by Prince William, the Duchess of Cambridge and Prince George, who were also at Balmoral. According to the Daily Mirror, Prince George’s passport has already been ordered. Visiting the Queen can be quite a daunting undertaking task, the New Zealand Herald story is a delightful read, filled with tidbits about how the morning alarm clock is sounded, how one addresses Her Majesty and other insider tips. On a slightly related note, it turns out another royal is wearing one of Kate’s favorite maternity labels. Zara Phillips wore a Seraphine maternity dress to last night’s Boodles Boxing Ball, an event Kate attended for several years. Zara was in Seraphine’s Colour Block Silk Maxi Gown. The two-tone silk frock retails at $365, the aqua and blue were beautiful with Zara’s coloring. Below we see Kate at the 2008 Ball, she was wearing an Issa London gown. Kate clearly enjoyed herself at the event. Last night’s black tie affair was wildly successful, raising a record-setting £200,000 for Starlight Children’s Foundation, a group granting wishes to seriously and terminally ill children. The event is sponsored by James Amos and Boodles Jewelry. The gala at the Grosvenor House Hotel in Mayfair was attended by other royals, including Prince Harry, as well as Princesses Eugenie and Beatrice. 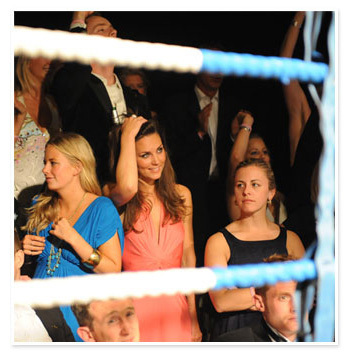 Kate’s sister Pippa also attended. 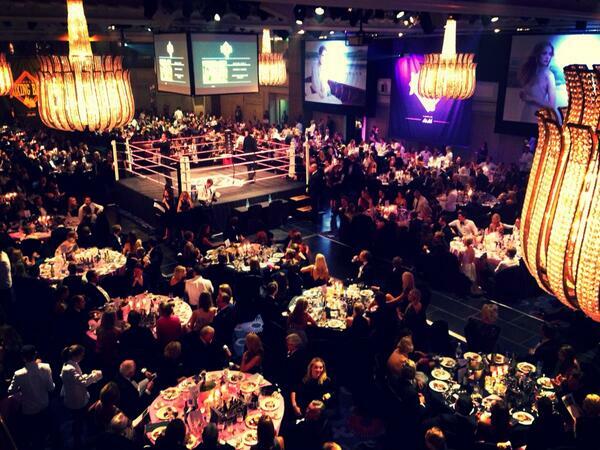 Visit the Boodles Boxing Ball website here, or the Starlight Children’s Foundation’s UK website here, the Foundation’s US website is here. 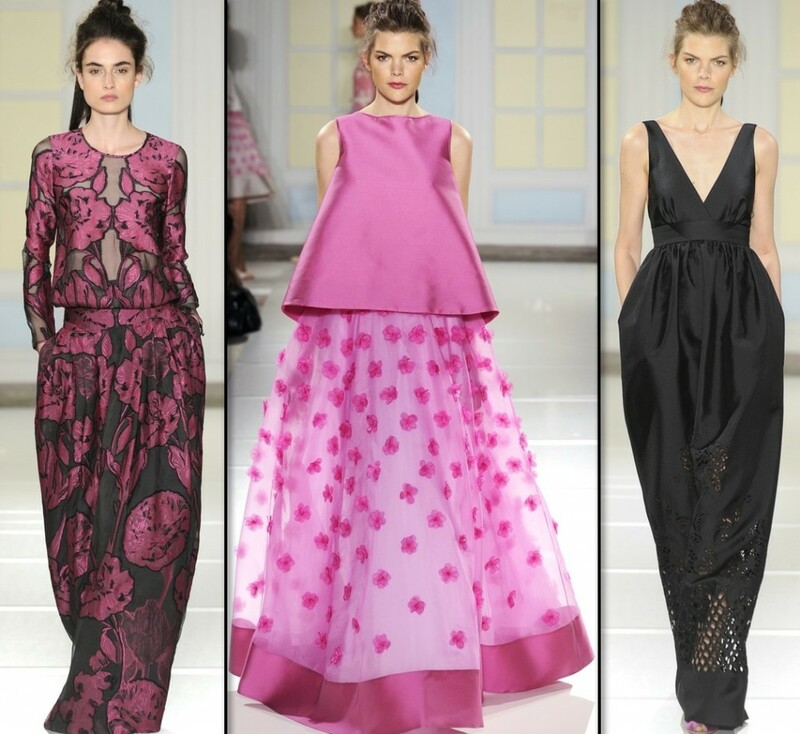 We are back with a look at the spring 2014 collections from some of Kate’s “go to” designers. We begin with Temperley London. 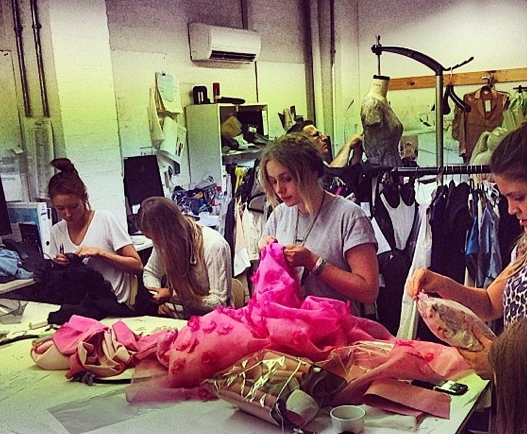 Below, an Instagram shared by Alice Temperley just days before the show, as final touches are being made to the collection. There was no shortage of celebrities on hand to see the collection. Below, actress Anna Kendrick (L) and Peaches Geldorf (R). Ms. Kendrick wears the Primrose shirt and skirt from the Cruise 14 collection, Ms. Geldorf was in the Aya dress from this fall’s collection. Also enjoying front row status, singer/songwriter Gabrielle Aplin and actress Rose Leslie; on the far right we see model Yasmin le Bon. 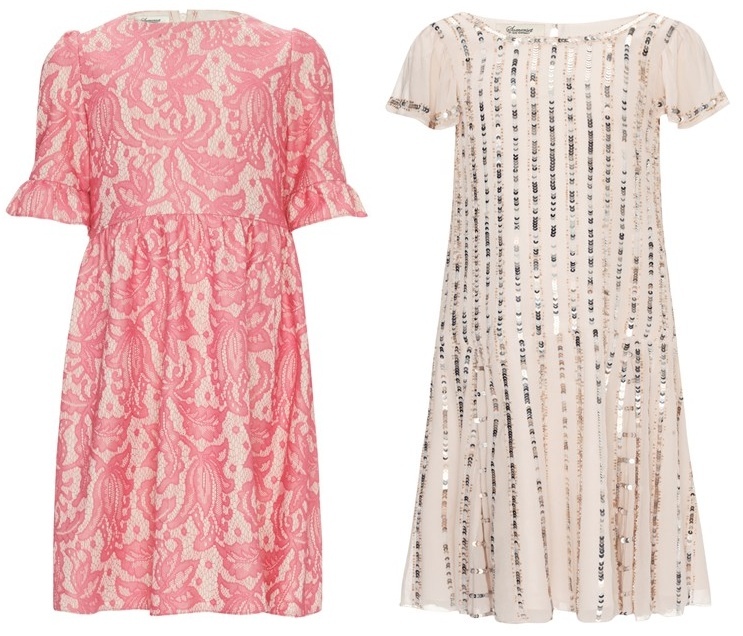 All three women are sporting Temperley and/or ALICE by Temperley designs. This trio of photos by LDN Fashion offers a splendid overview of looks for next spring. Two images from the Temperley Facebook page also offer perspective. 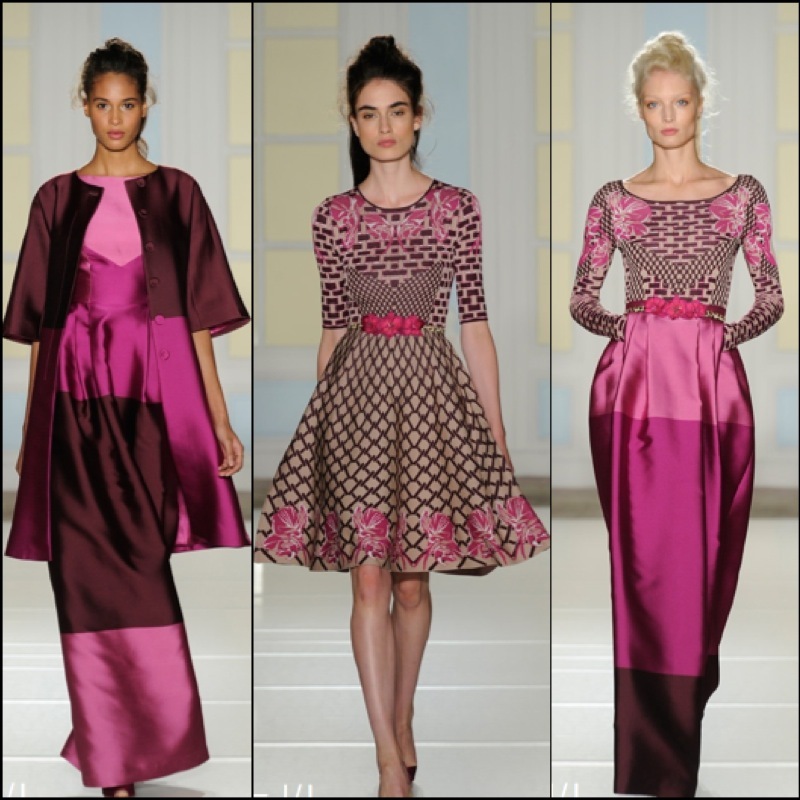 The first looks down the runway were crafted in a lush pink and maroon/burgundy palette. For critical reaction to the collection we turn to British Vogue. Princess pretty, and proof – if it were needed – that pink will still be going strong as a trend next summer, Temperley began with a tiered dress of raspberry, plum and blush – its voluminous silhouette setting the tone for much of the collection. 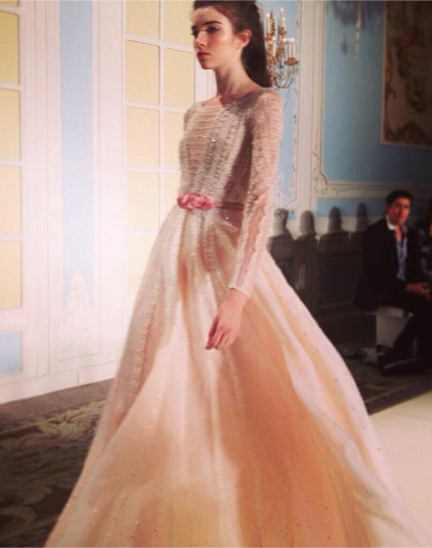 The next group featured more muted tones but the feeling remained elegant and luxurious. 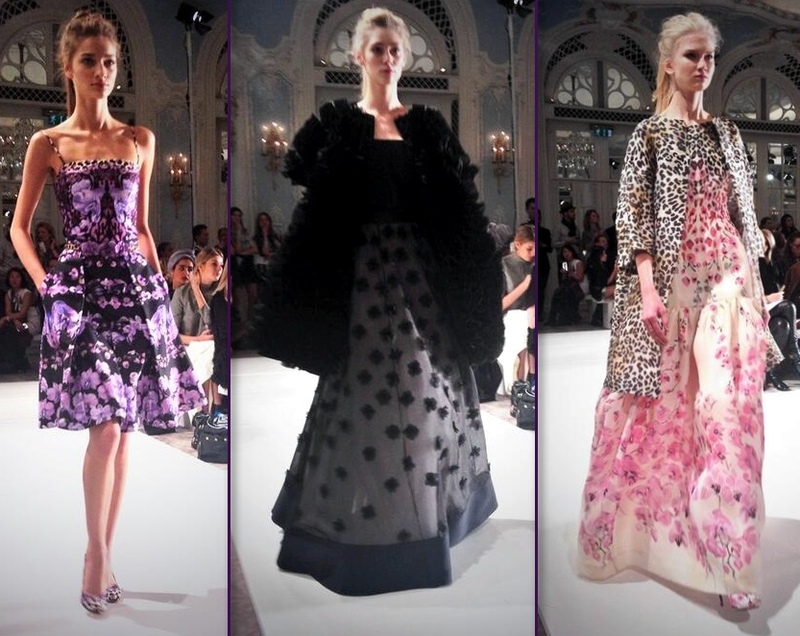 Alice Temperley delivered a charming, retro and very English interpretation of la dolce vita. 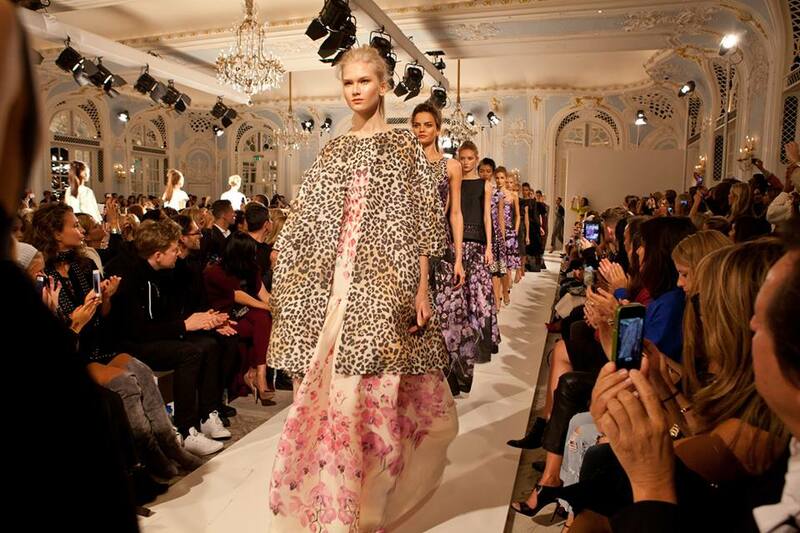 The prints said it all — leopard spots mingling with a tumble of pink or mauve orchid blossoms — as did the pale Wedgwood colors, applied to Sixties couture shapes in heavy silks. Some of the leopard sports referenced by WWD. The black, purple and lavender group was effective. The palette made for striking pieces. Leopard print broke up the girliness though – a fabulous full-length skirt fell from a lilac appliquéd upper in a moment that spawned an immediate waiting list. 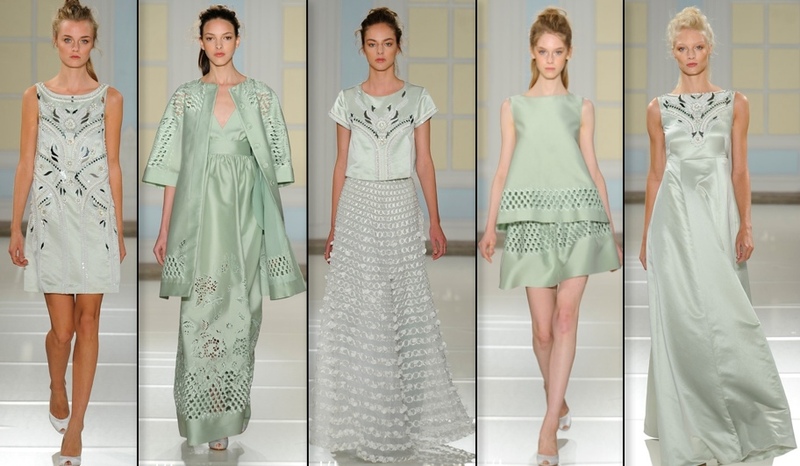 Another mint green bejeweled tunic proved that Temperley knows her customer and gives them just what they want. Key pieces included trapeze shapes and a new way to deliver a bolero jacket, with sleeves that were structured and flowy at the same time. But, as always, it was the surface details—the rose damask fabrics, the complete symmetry of the embroidered flowers on organza, the crystal embellishments, and the cherry-blossom prints—that seduced. 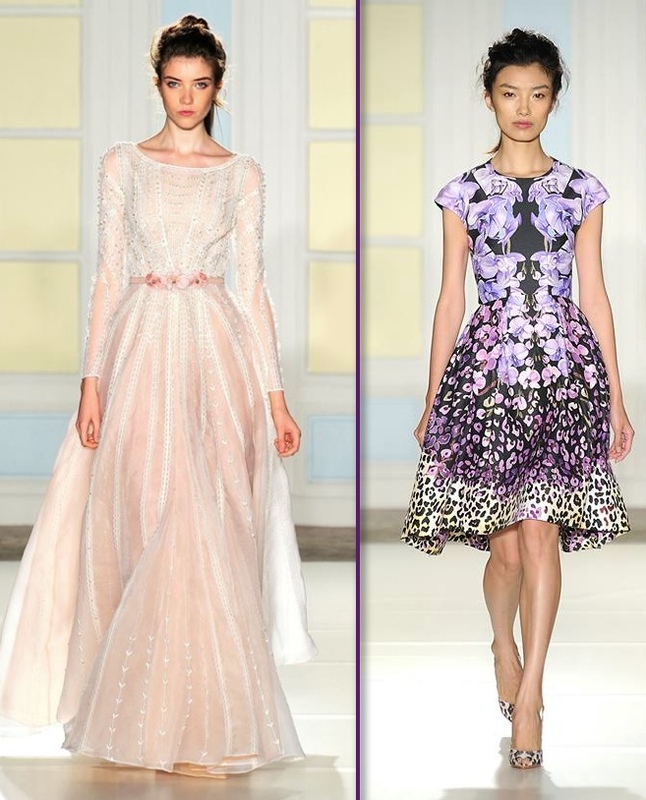 Temperley has such a sure hand, she even made a leopard print mixed with a lilac floral look good. 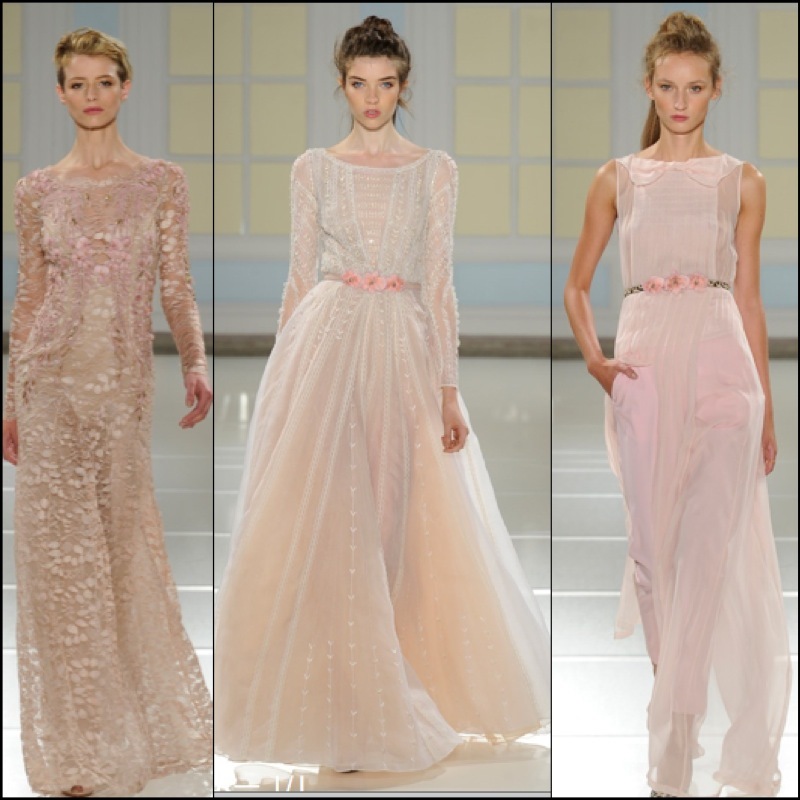 These were three of my favorite looks, they typify what I perceive to be a significant part of the Temperley aesthetic: light, floaty, and feminine designs. 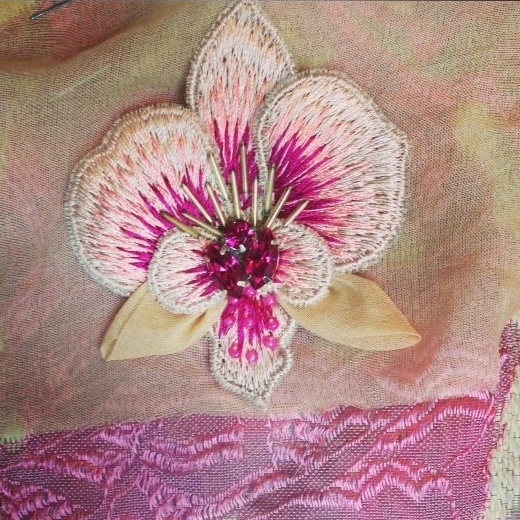 The detail work on some of the garments is exquisite. 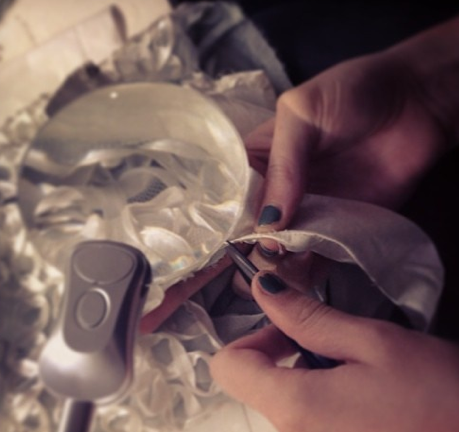 Some of the handwork is so delicate, work on it required a magnifying glass. 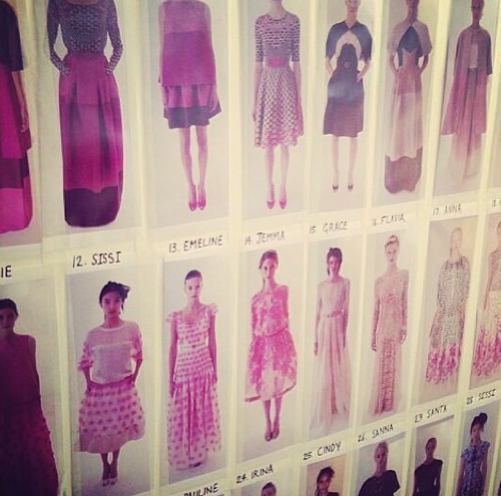 Another look via Temperley’s Communications Director, Madeleine Macey. There were a very few styles that didn’t work for me. The white ensembles seen below were somehow reminiscent of vintage honeymoon lingerie, although the satin coats are clearly beautiful pieces that would stand on their own merit. And as much as I love pink and satin, the two styles below reminded me of prom dresses, the satin borders in combination with the pink flowers detracted from the overall look. What the clothes sometimes lacked in youth and modernity, they made up for with dazzling workmanship and gentility. 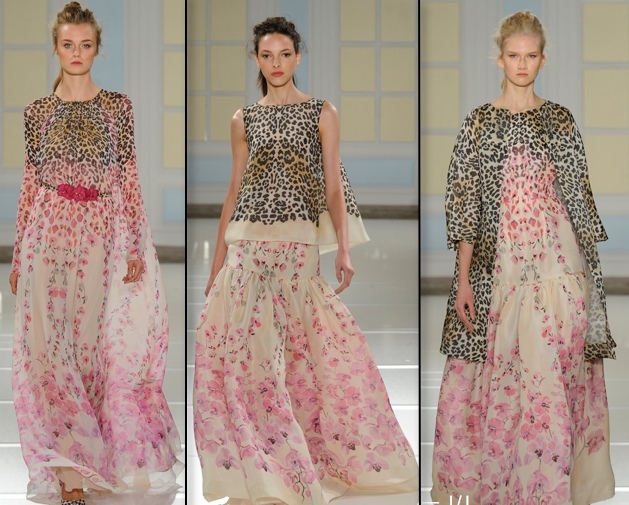 It was a beautiful collection, I was surprised by how appealing the leopard paired with the floral motifs looked. It’s going to be fun watching the Duchess of Cambridge take her pick of this selection next summer. There are any number of garments that are ideal for Kate’s style, making a short list would be quite a challenge. One note for those fond of Kate’s Odele sheepskin coat by Temperley, the piece is back in stock for fall. For those unfamiliar with the coat, here is the product description. Be advised this one will take a toll on the pocketbook, it retails for $3280. 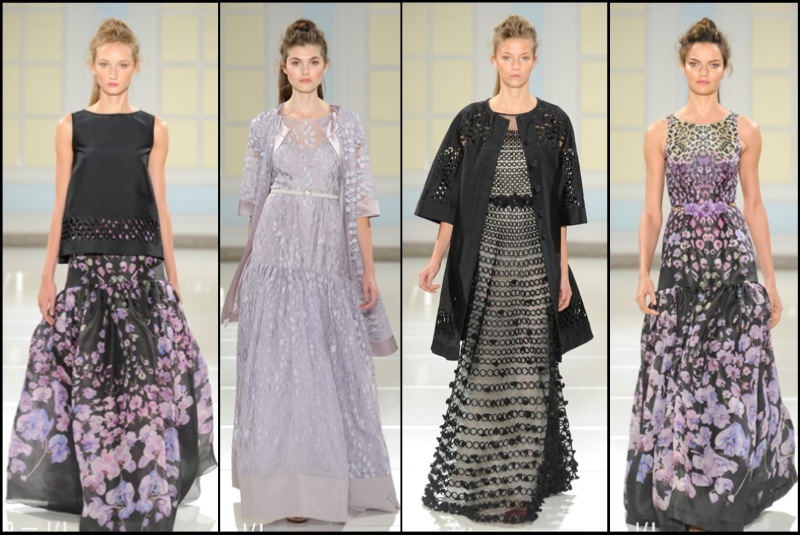 Also today, a look at new designs by Alice Temperley for her very successful Somerset collection offered exclusively at John Lewis. But these styles are not for adults – the collection is expanding to include girls’ sizes. 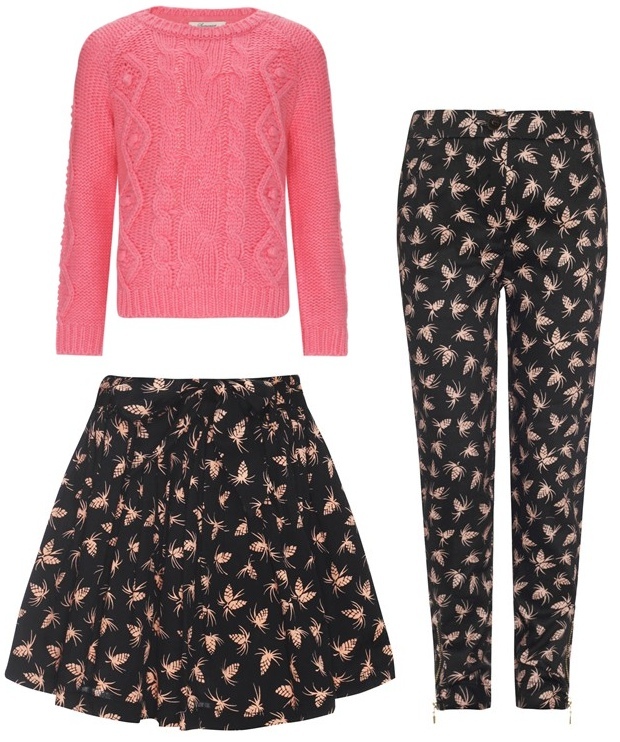 Below, a pink knit sweater (jumper) and acorn print separates. 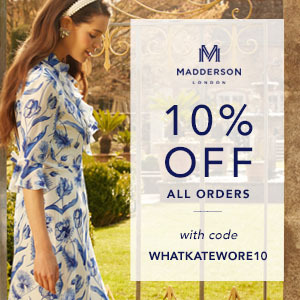 ….will feature dresses and separates that echo pieces in the womenswear collection – and the designer hopes that her new mini customers will love them just as much. 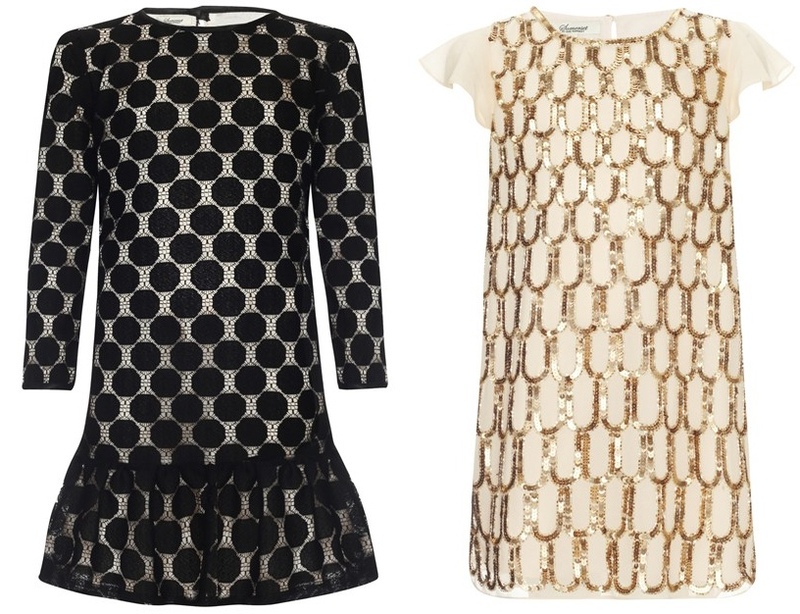 One needn’t look far to see Girls’ designs echo that their grown-up counterparts. 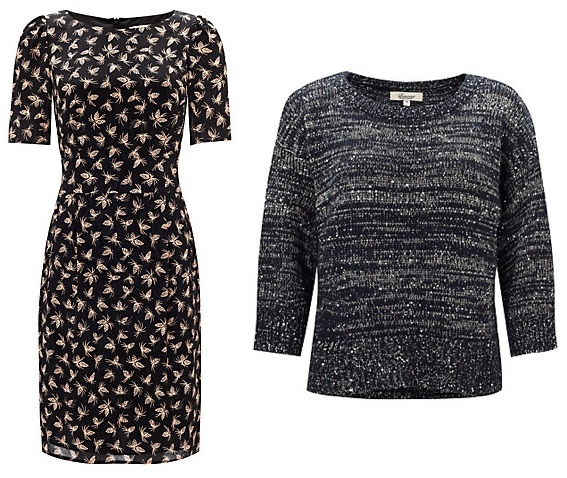 Below, the women’s Pine Cone Dress and Sequin Detail Jumper. It isn’t difficult to spot some of the designer’s signature touches. There is a total of 16 pieces in the debut Girls collection, designed for ages four to twelve. The collection launches this Thursday, September 26. Many fall styles in the women’s collection are available in-store and online, including accessories. Below, the Puxton Ankle Boots and Clover Medium Cross-Body Bag. For US residents interested in the collection, John Lewis does ship to the US. Our other looks today are from the Topshop Unique runway, one of the retailer’s boutique lines. 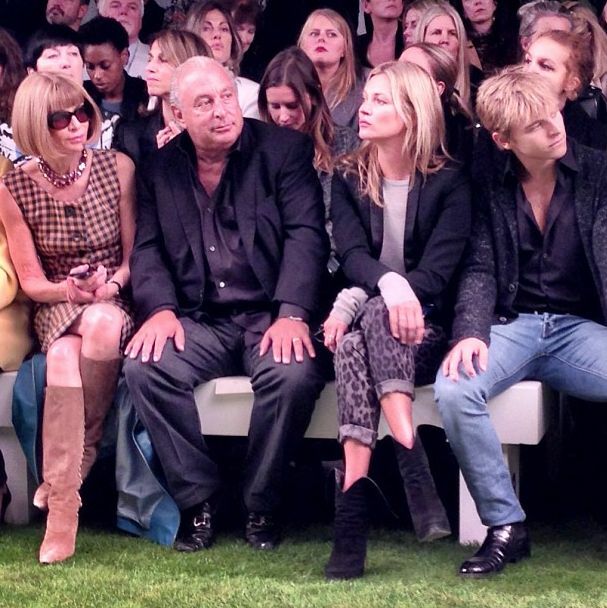 There was also a celebrity-filled front row at this venue, including Anna Wintour, Sir Philip Green (owner of the retail powerhouse) and Kate Moss. Some of the models backstage. One of the key color palettes included a rich blue and deep green, used in geometric patterns. Most looks were decidedly casual with relaxed silhouettes. One has to work harder to imagine Kate in pieces from this show, the clarity of vision isn’t quite so obvious. 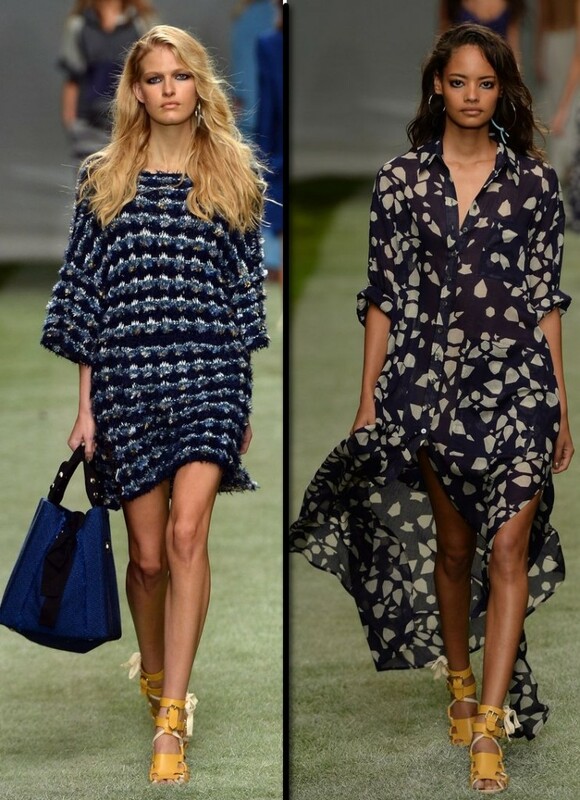 To see all of the show looks on the runway, click here to visit Topshop’s Pinterest page. We will be back in just a few days with more runway styles and an exciting giveaway! Hello and happy weekend to everyone. We have several updates to share, and they all involve boots. We begin with the case of the UFO (Unidentified Fashion Object) Boots, something that has stymied many of us for years. The object of our confusion? 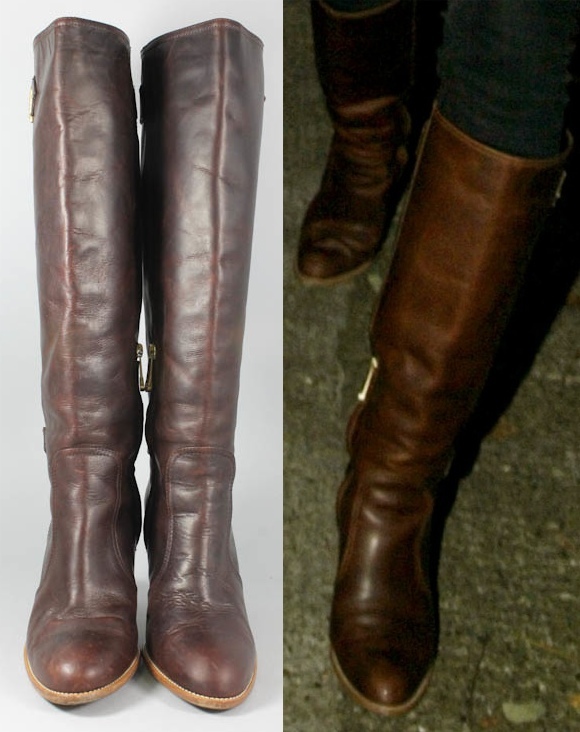 The boots worn by Kate in this 2007 photo; the future Duchess is seen leaving Raffles nightclub with younger sister Pippa. Identification of the boots has proven perplexing, many a search was undertaken to determine who made them and several times it was thought we had discovered the answer. At one point it seemed they might be by Hobbs, another time it looked like they could be Banana Republic, Sara Wellman did a significant amount of groundwork, contacting companies. Fortunately, a friend from the WKW Facebook Community has finally solved the puzzle. Behold, Kate’s boots. They are by a storied Swiss brand, Bally. Credit for resolution of the boot debate goes to Rachel Beasley Nesbit, also known as Rachel N. Wales on the WKW page. 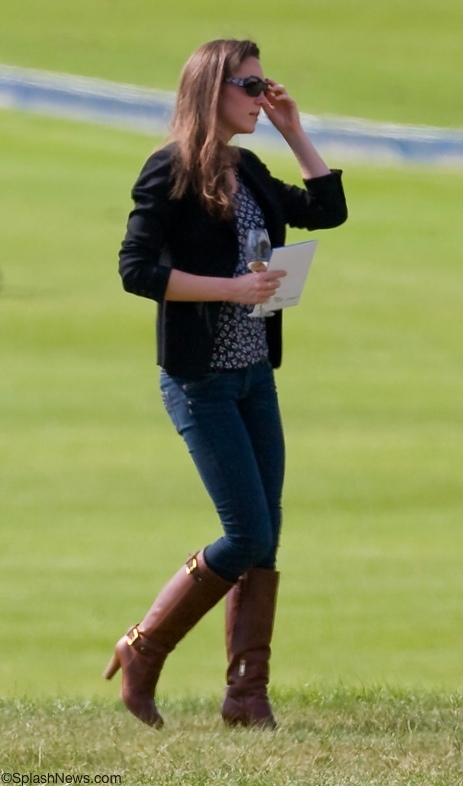 Here is another look at Kate in the boots, this time at Coworth Park for a May 2009 polo match. 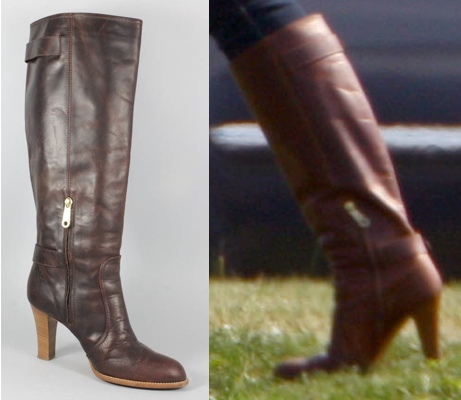 While the photo enlargements are a little blurred, you can see that Rachel’s boots are the same as what Kate wore. An interesting note, the boots were described as “BALLY Burgundy Dark Red Coated Leather Double Buckle” boots, I would not have pegged the color as burgundy. A look from another angle. 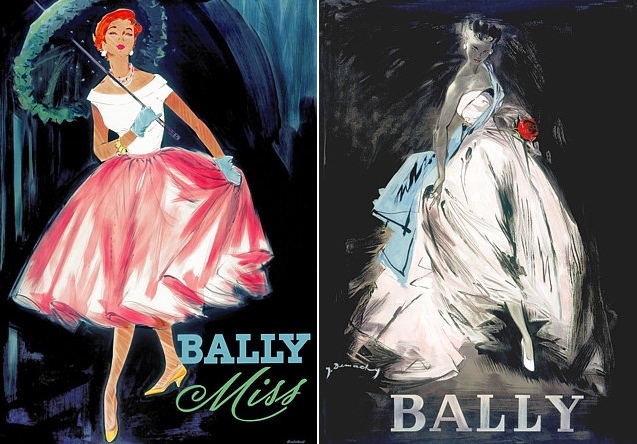 No doubt some readers will recognize the Bally name, the company has been around since 1851. Bally makes shoes and accessories for both men and women. Below, an image from the brand’s fall advertising campaign, Bally continues to offer women’s boots. The new campaigns may be beautifully staged and photographed, but some of us fondly recall the older Bally advertisements, like these. The company did well for more than a century. In 1977 family members sold their share of the company and shortly afterward Bally encountered problems. Since then it has changed hands more than once, it is now owned by Labelux Group, the same firm that owns Belstaff and Jimmy Choo. 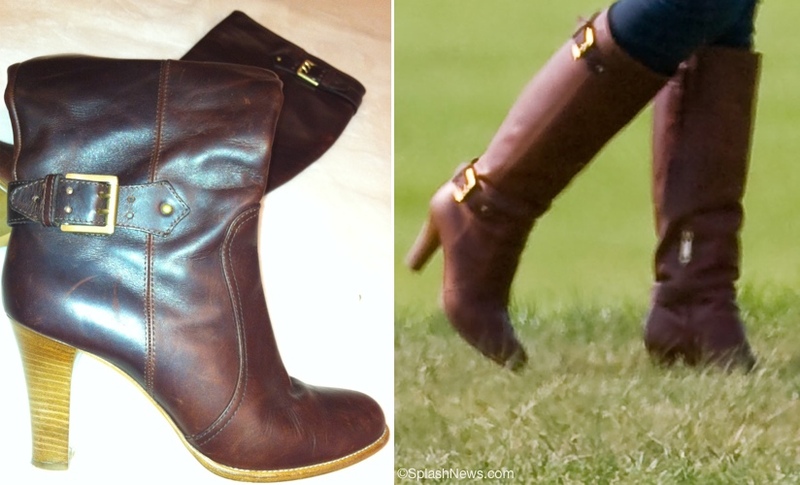 Back to Kate’s boots, here you see Kate wearing them at those same polo matches. Bally has a store in Mayfair, right on Bond St., it’s possible this is where Kate purchased the boots. I doubt we’ll ever know precisely where they were bought; Bally has stores around the world, many of them in locales Kate has visited over the years. 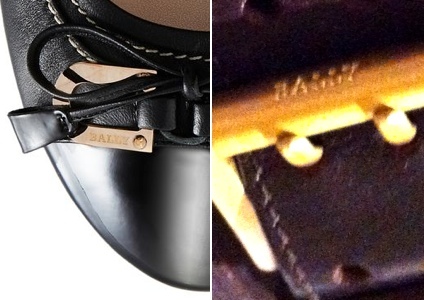 The company does mark its hardware, we show the ‘Bally’ name on a contemporary shoe alongside a clasp on the boots Rachel purchased. Bally designs for men can be found at upscale venues like Saks, but not the women’s products; an online search shows products at Bally’s website, but also at discounters like DSW, and Sierra Trading Post. Below, an image from the Bally website. 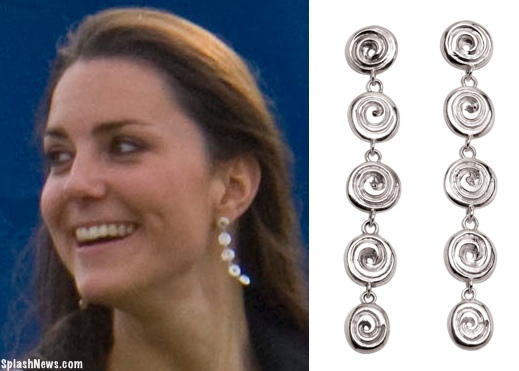 Those familiar with Kate’s jewelry will recognize the Patrick Mavros ‘Ndoro’ earrings she is wearing in the 2009 polo photos. The Ndoro design is a classic motif; Mr. Mavros describes its Zimbabwean history and his use of the design here. The earrings are still available at the jeweler’s website, they are approximately $235, or £150. Kate’s top is a French Connection bird-print piece, we thank Anna and My Small Obsessions for this information. Kate is also seen carrying her trusty Prada bag; I have not had time to look for the maker of her black jacket (sweater? ), nor her jeans. For those curious about Kate’s attire in the 2007 photo with Pippa, the blazer is by British label Fenn, Wright & Manson. The silk velvet jacket is single-breasted with curved lapels and flap pockets, our thanks again to My Small Obsessions for this info, Anna also says Kate is wearing a’ Silk Grecian Style Tunic Top’ in the photo, by one of her go-to labels, Reiss. 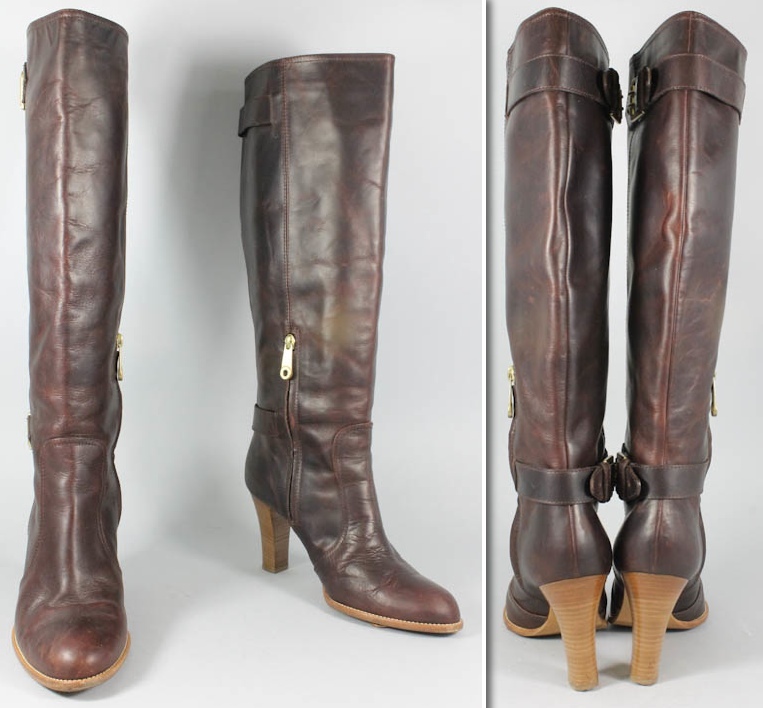 Our other update, involves another pair of boots, only these were identified some time ago. The classic zipped riding boot in luxurious black suede is elegant and sophisticated for easy chic all day long. Multiple elastic inserts add to the detail, elongate the leg and allow for flexible width fittings. Wear over skinny trousers or with dresses for chic Winter style. Here we show Kate wearing the boots when shopping in February, 2012 and a closeup from when she was released from the hospital in December of 2012. 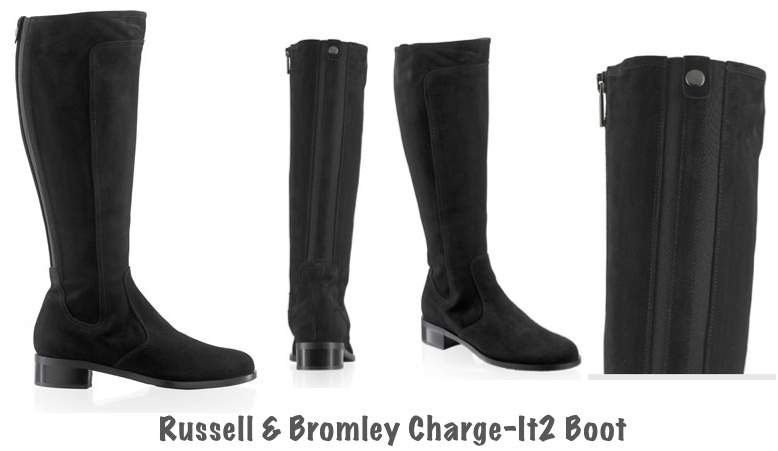 The boots sell at Russell and Bromley for £275, approximately $430 at today’s exchange rates. LK Bennett has also re-issued the Darwin Shearling Jacket the Duchess is wearing above left, it now retails for £795, roughly $1250. 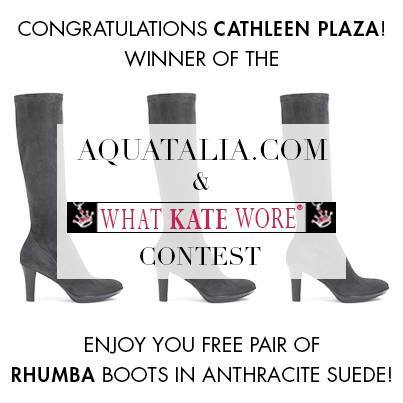 Our final note today is also about boots, in this case Kate’s favorite Rhumba boots by Aquatalia, the prize in our giveaway showcasing our fundraiser for EACH, one of Kate’s patronages. The lucky winner is…. Cathleen Plaza wins a pair of the Rhumba in this year’s new color, Anthracite. Our thanks to Aquatalia for their generosity in sponsoring the giveaway. Tags : Duchess Cambridge black boots, Duchess Cambridge black suede boots, Duchess Cambridge brown polo boots, Duchess Catherine boot designers, Duchess Kate style, Duchess Kate suede boots, Duchess of Cambridge blog, Duchess of Cambridge fashion, Kate Coworth polo boots, Kate Middleton Aquatalia Rhumba boots, Kate Middleton Boots, Kate Middleton boots with heel, Kate Middleton brown Bally boots, Kate Middleton clothing, Kate Middleton fashion, Kate Middleton fashion blog, Kate Middleton leather boots with heel, Kate Middleton Russell Bromley boots, Kate Middleton styles, Kate Russell Bromley Charge It 2 boots, Kate Russell Bromley Charge-It2 boots, Princess Kate black boots, What Kate Wore, What Kate Wore blog, who made Kate Middleton's suede boots?